From Beginners to Experts and Beyond! Below is a very general chart. to develop them into a skiing or snowboard riding athlete. Beginners Beginner Skiers develop the confidence for fun on your first day skiing on snow. Be well ahead of others being proficient on stopping, controlling your speed, feeling balanced, engaging edge control and understanding what skiing is about. Intro to Over-the-Edge Techologies. 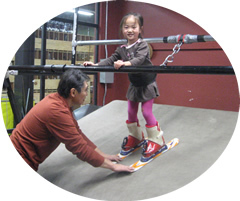 Beginner Snowboarders develop balance and establish the toe and heel edging for linking turns. Know how to slow and stop. Understand what it takes to control the board. Intro to Over-the-Edge Techologies. Advance Advance skiers understand effortless skiing, mastering the edge control with instant reflexes and precise execution. Establish fine movements that translates into accurate supple turns in all types of terrain. Engraining the Over-the-Edge Technologies. Advance Boarders acquire superior balance and feet control needed for all mountain riding and air. Learn to shift weight, absorb and carve. Engraining the Over-the-Edge Technologies. Expert Expert Skiers and Boarders will develop a custom program structured to their needs. Expert Skiers and Boarders will have a custom program structured to your needs. Others Ask about our Monoboard skiing, Telemark skiing, Cross Country Skiing, Ski Blading and Wake Skating lessons on the Endless Slope. Our mission is to help our students become better skiers and snowboarders by becoming riding athletes that know no bounds in their growth development. Our lessons are individually tailored to each student going at their pace and their individual needs. These lessons do not guarantee that a new beginner will ski or snowboard the first time they go onto the snow, it merely improves their chances. Nor does it imply that they will not get hurt. Again, it prepares their chances of becoming successful by setting a firm foundation of riding fundamentals. Our lessons are different from those typically found on the mountain or at the resorts. 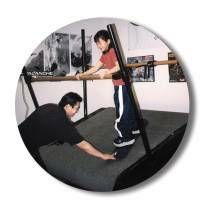 We compliment those lessons working specifically on fine development of: appropriate positioning, improved reaction, proprioception sensory, dynamic reflex and riding movements, acute balance, distinguishing between riding and support muscle development, engraining muscle memory and conditioning and strengthening. This process can begin and much of it developed in the comfort and greater safety on the Endless Slope. This is the SnoZone Endless Slope advantage! Learning is so much easier and comfortable in the right environment!